The Cheimonette Tarot is full of intricate symbols. Eden Gallanter, the artist, used colors, images, and associations that are based on hunches and dreams as well as her own understanding of fifteen years of study and experience using tarot cards. "I	wanted	to	make	a	deck	that	allows	you	in	as	a	co-creator,	and	to	make	images	that	evoke	a	large	array	of	different	thoughts	and	associations...	tarot	teaches	us	how	we	work	by	using	symbol	and	metaphor. Tarot	is	chaotic	psychotherapy,	and	you	can	do	it	yourself!" 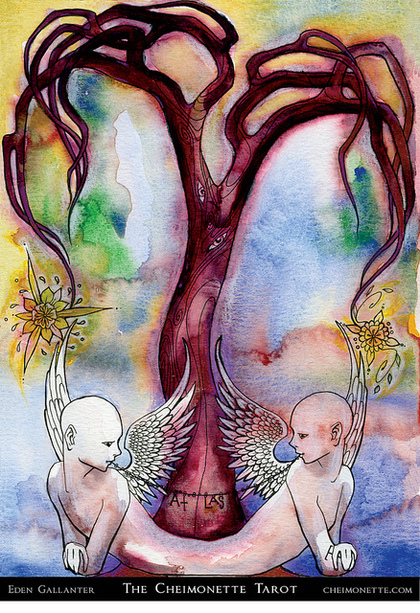 The artist's description of her Love card: "	I	see	it	as	an	exalted	form	of	self-nurturing	independence,	replete	with	the	mysteries	behind	an	existential	world	view	and	suggestive	of	another	consciousness	(the	eyes	in	the	Tree	of	Life	look	out	at	us	and	its	branches	tangle	above	the	heads	of	the	conjoined	angels	below).	"